The insertion ultrasonic water meter is on the principle of transit-time and developed on the basis of Abest’s insertion ultrasonic transducers. With patent technology, our battery powered ultrasonic flow meters can support insertion transducers and clamp-on transducers. Comparing with external powered ultrasonic flow meters, battery powered ultrasonic water meter is more difficult to develop because battery life will limit the power consumption. Unlike inline style ultrasonic water meters,insertion ultrasonic water meters just need to drill a small hole, so it can reduce installing cost sharply. 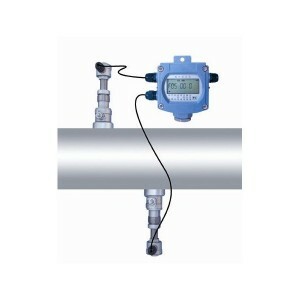 When pipe size is larger,insertion ultrasonic water meter has a high-effecitve cost than inline type ultrasonic flow meters. With patented hot-tap installing tools, insertion transducers can be installed without flow stop when water pressure is below 0.8MPa. This won’t delay the production plan. *Pipe size: standard insertion transducers DN80-DN800mm;for larger pipe, will need special big insertion transducers. If pipe material is cement or concrete, it will need to use cement insertion transducers. *Keypad and operation: local keys for windows browsing, RS485 remote keypad for setting, free setting software is available,tool. *For cement or concrete pipe, special insertion transducer is available. *Battery life: Over 4 years while under normal working status.